Travelling with his ‘community mobilizer’ mother to check on children in their community, Celestin credits her with fostering his interest in this field. He worked as a clinician in Rwanda and is now a doctoral student at the School of Population and Public Health, supervised by Associate Professor Michael Law. 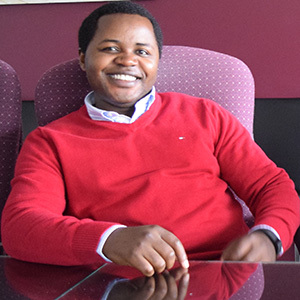 Dr. Hategeka’s research will evaluate the Emergency, Triage, Assessment and Treatment PLUS (ETAT+) admission care program, which is in place in select areas of Rwanda. ETAT+ is a five-day training course that teaches health workers best practices for recognizing and managing the most common medical causes of hospital admission for children in East Africa. It aims to improve this emergency care in the initial 24 to 48 hours of hospitalization, to reduce the rate of death for children under five in Rwanda. This is a particularly vulnerable population, Dr. Hategeka said, at greater risk of death within the first few days when very ill, but presenting with preventable conditions such as dehydration. Other projects were imported from high income countries without adapting them for the local context, Dr. Hategeka said, whereas ETAT+ was developed in Kenya and introduced as a possible option for district hospitals. He hopes his research will show whether the system is making a difference, how it is being implemented, and how barriers to implementation can be addressed.